Alright! Bam! Excited? I surely am. 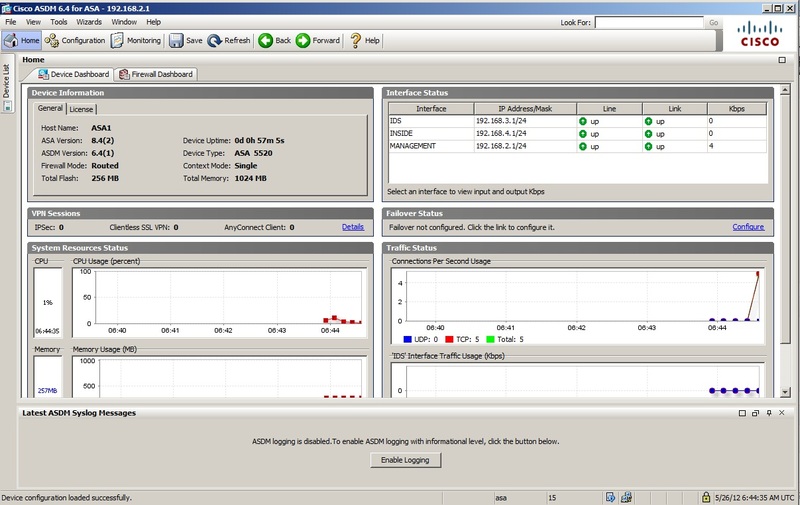 Cisco ASA on my laptop and I can lab anywhere! Now lets establish more than console access via GNS3 and get SSH/HTTPS/ASDM running. The reason I am so pushy to get ASA on a device is because certification guides all show how to do a task both ways. Handy in my opinion. Plus it doesn’t hurt for study reasons! Administrator Rights – Need to bridge your interfaces! Before we go making SSH access we need to connect our device into GNS3. Simple enough but can be daunting for some. I currently use Windows 7 on my lab machine due to the speed of spinning up VMs and the easy of connecting them in. I have dabbled with taps in Linux and it hurts my face and wastes my labbing time. To connect your host to GNS3 I made a bridge interface with a pre-existing VM interface and my Gig Ethernet interface of my laptop. Assign an IP address to your device. Think Smart and It’s simple! Now that we have created this adapter and assigned this address ( other end is g0 on the ASA – 192.168.2.1 ) we can create a magical unicorn (cloud) link! Open up GNS3 – Drag a cloud next to your ASA and place an Ethernet Switch down too. Right click on the cloud and configure. 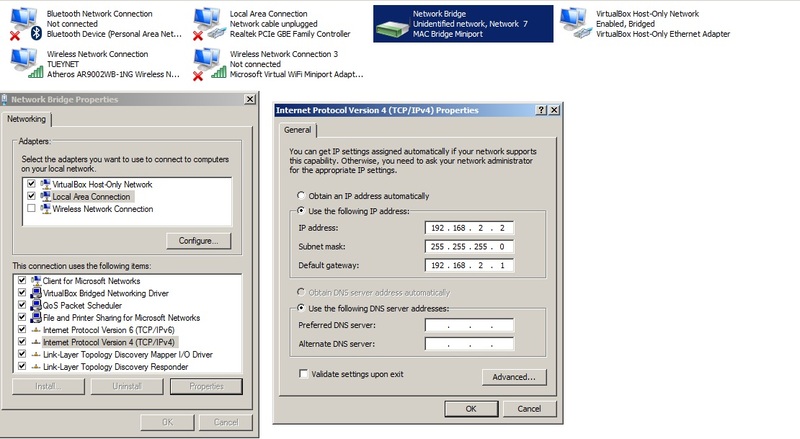 Select the MAC address bridge and add that connection. 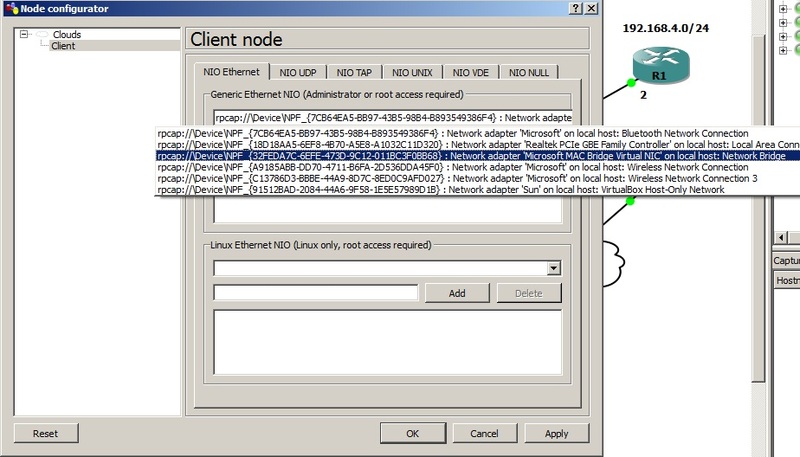 Now lets get some initial configuration on this ASA and get connectivity from our Windows machine! We are getting there people! Slow and steady wins the race. Note: GNS3 lists interfaces as E0-5. The ASA sees them as G0-5. Voila! Subnet 192.168.2.0 from the Management interface has been allowed for SSH. Now to test a ping from the 192.168.2.2 host and then connect via SSH! Now let’s TFTP the ASDM software from 192.168.2.2 onto the ASA at 192.168.2.1. Rather simple process. TFTD32 is installed onto the host at 192.168.2.2 and the file ASDM-641.bin is in the tftp root. Installed. Now we just enable the HTTPS web service and off we go. So close! Study can almost begin! 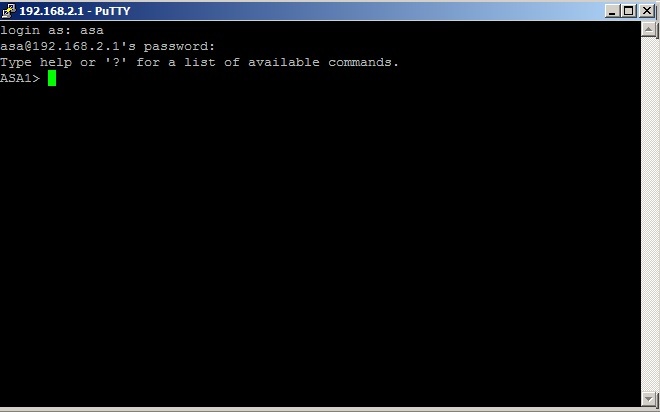 The commands to set up the HTTPS web server are not far away and very similar to the SSH syntax. We first enable the service then allow what subnet on which interface to access it. Let’s save this as a basic config. Now we open up Internet Explorer (Chrome went funky chicken on me) and lets browse to https:\\192.168.2.1 and see what happens. Now – let us login via ASDM and use the web gui! Click Run ASDM. After some loading check out what will appear next! And with that we have working ASDM! Now go forth and spread the good work. Let me know how you have found this post and I will attempt to help those below who cannot get this working. Again I will not give out any software illegally. Happy Labbing! You are most welcome. Let me know how you get on! I had the same problem, but it was solved after following all steps and create a new project. I spent several hours with same project, I just only modified settings, that was the problem. When I create a new project, ASA worked fine!!! image to a file name “disk”. This can be verified by “dir”. Thanks. I will update. I just copied and pasted from the CLI. Regarding the second one I didn’t need to do that as it chose the asdm image by default as it was the only one there. In this simulated environment there is nothing on the desk at all; opposed to asdm/asa image being installed locally on a physical. The command is great if you have multiple versions of ASDM and want to select a particular one. thank you for reading. I appreciate the feedback! 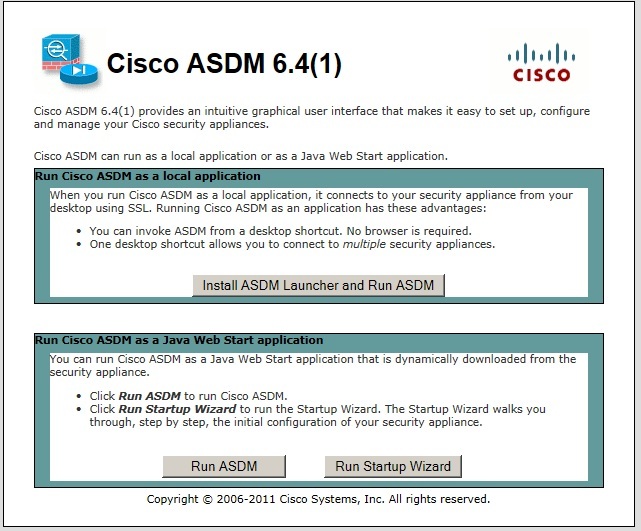 pls let me know which version of ASDM shouls i use for ASA 8.4 . and whare i will get it ? Perfect man. Now got a fully working ASA with ASDM. Great to hear and happy studies.